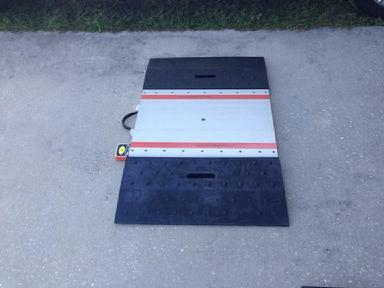 Standard low profile platform is 1.25 inches thick, it comes with dual rubber ramps for easy pull up and off. Each platform can be ordered in three capacities, 10K per platform, 15K per platform or 30K per platform. 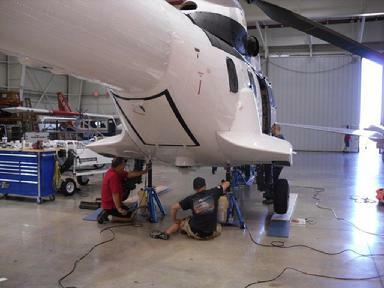 Shown to the left is our low profile helicopter weighing platform in wireless configuration. 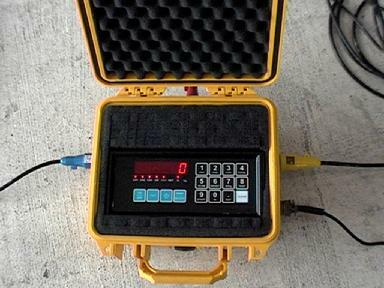 We have low profile platforms both in wired configurations with 50ft cables and digital indication and wireless configurations with 150ft range. Our platforms are 27.5 inches long and are 12.5 inches wide. They are 1.25 inches tall and pull on and off is easy using the supplied ramps at each end. Many of the Airbus helicopter types as well as other helicopter types have single main wheels and dual nose wheels. Our low profile system makes weighing your PUMA easy and effortless. Available in wired or wireless configurations to fit your needs or budget! Shown here, you can see that our units capture the dual nose wheels of most applications. The video to the right was made as a demo for the AS365 helicopter, the wireless will be configured for the low profile system accordingly and will be slightly different including the picture. M2400 (wireless) -10LKP is our low profile (L) 10,000 lb (KP) scale system and each platform is capable of weighing up to 10,000 lbs per platform for a system capacity of 30,000 lbs. M2400 (Wireless) -15LKP is our low profile (L) 15,000 lb (KP) scale system and each platform is capable of weighing up to 15,000 lbs per platform for a system capacity of 45,000 lbs. -10LKP is our low profile (L) 10,000 lb (KP) scale system and each platform is capable of weighing up to 10,000 lbs per platform for a system capacity of 30,000 lbs. -15LKP is our low profile (L) 15,000 lb (KP) scale system and each platform is capable of weighing up to 15,000 lbs per platform for a system capacity of 45,000 lbs. We also carry wired or wireless top of jack systems for the PUMA helicopter series. Our -10CS or our -15CS kits are available in wireless or wired configurations. Puma being weighed by top of jack load cell system.